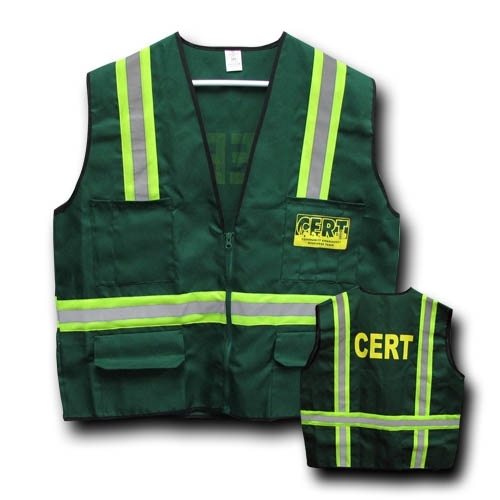 CERT Safety Vest, zippered, 6 pockets, Reflective Safety Stripes, durable green pocket vest jacket features C.E.R.T. logo on front, back, largest selection of sizes! 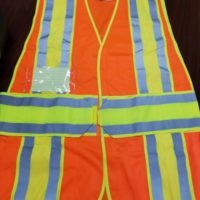 Zipper-front reflective jacket vests are now available in MORE SIZES: S, M, L, XL, XXL, XXXL Please choose vest size when ordering* Let us know if you need additional size options, we will be happy to check availability. Our deluxe CERT vests are also available blank with no logo or imprint. Vests come with standard CERT imprint. If you need your vests blank without imprint or logo, you must indicate this in Customer Notes section when placing order. Contact us with any questions. 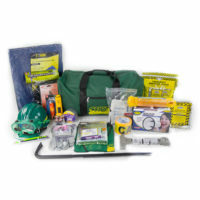 Reflective CERT safety vests are terrific for first responders and emergency crews, features four handy outside pockets, plus two inside pockets. 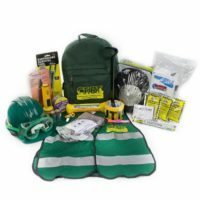 This great zippered Multi-Pocket Reflective Vest is perfect for holding rescue gear, safety accessories, essential rescue worker ID supplies. Our popular CERT pocket vests make terrific gifts for official response team members, along with CERT kits and other first responder team accessories with national C.E.R.T. logo! 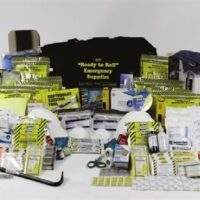 Contact Sunset Survival for details on custom printing for your team’s C.E.R.T. vests.